There's no better way to spend a Saturday in Estes Park than by getting outside to enjoy the majesty of Rocky Mountain National Park. Saturday, September 9, join the Rocky Mountain Conservancy-Field Institute for our "Hike with Naturalist" to Bridal Veil Falls, and explore a hidden gem in our own backyard while avoiding the crowds of Bear Lake and Trail Ridge Road. The moderate six-mile hike will depart from the quiet Cow Creek Trailhead. As the trail meanders along Cow Creek, hikers will be treated to expansive views of Lumpy Ridge, pristine meadows, and autumnal aspen stands. Wildlife viewing opportunities are sure to be plentiful, as the area is frequented by elk, deer, and birds of prey. After three miles, hikers will reach the grand finale: the thundering twenty-foot Bridal Veil Falls. Best of all, our expert naturalist will be present every step of the way to answer questions and provide background on the area's history, geology, and wildlife. 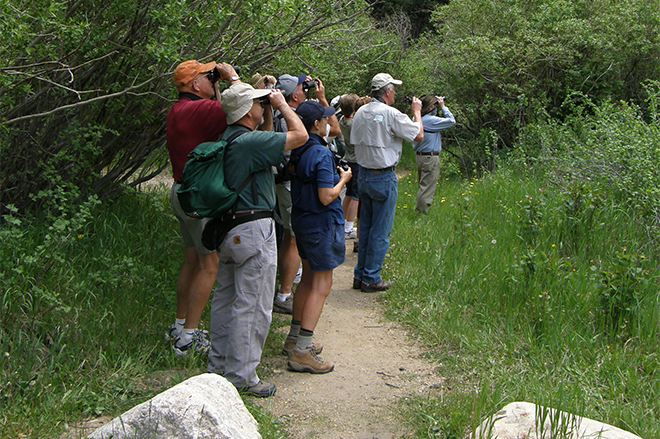 For more information on our "Hike with a Naturalist" or to register for the September 9th hike, call (970) 586-3262, or visit us online at www.rmconservancy.org/events.